The team was very responsive to our minor issues. We didnt really need much assistance other than we needed the pool heater turned town because the weather was so hot! They responded to all my questions very quickly. 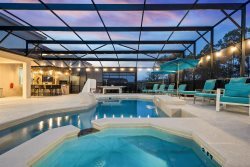 We loved everything about this house-from the pool to the movie room. Everything we could think of was already stocked in the house which made our trip seamless. Its a well-maintained, clean house. We were nervous at first because you can never be too sure on how clean things are but this house was spotless and beautiful. Our stay at Reunion in Kissimmee was so enjoyable. Everything was exceptional and we would definitely return. I enjoy staying at Reunion homes because they are very well kept, clean, and close to the local golf courses we like to play. My family enjoyed staying in such a beautiful property, very well decorated with amenities for the kids. The place was very spacious and cozy. Very well decorated, cozy, clean, felt like home. It was perfect. The unit was in an excellent location with Reunion Resort enabling a drive to Publix within 4 minutes. The unit was clean and comfortable with a nice view of the Arnold Palmer Golf Course. The Reunion Vacation Homes staff are first rate and were a pleasure to work with.